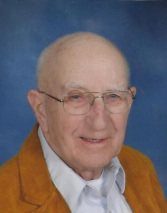 Ernest C. Hoffman - Perry-Komdat Funeral Chapel, Inc.
North Greenbush-Ernest C. Hoffman, 93, a longtime resident of Averill Park died on Wednesday, November 20, 2013 at the Van Rensselaer Manor. Ernie was born and raised in Rensselaer and was the son of the late Clarence and Margaret Schumann Hoffman and was the husband of the late A. Lucille Looney Hoffman until her death in 2010. Ernie was a graduate of the Rensselaer High School and Cobelskill AG & Tech where he earned an associate's degree. Ernie joined the Army Air Force during World War II serving stateside and this is where he met Lucille. He was discharged with the rank of sergeant. Ernie was a deliveryman for Dairylee from 1941-1971. After he retired from Dairylee, Ernie worked for the Averill Park School District for 20 years where he was a bus driver and also served as superintendent of grounds. Ernie was an active life member of the Averill Park - Sand Lake Fire Company and had served as chief from 1960- 1965. In later years Ernie served as a fire police. Ernie and Lucille had resided in Averill Park for a number of years before moving to Diamond Ridge in 2008. For a number of years Ernie was active in Boy Scouts, serving as an assistant scout master and merit badge counselor. Ernie was a former member and a past boardmember of the Sand Lake Baptist Church and more recently was a member and former board member of the Zion's United Church of Christ in Taborton. Ernie was a member and past president of the Sand Lake Seniors, served on the board of the Sand Lake Union Cemetery and the Rensselaer County Fire Chiefs Assoc. and was a former member of the Sgt. Walter Adams American Legion Post Averill Park. For many years Ernie maintained a summer camp on Big Bowman in Taborton. Survivors include his children, Amy C. (Stephen) Barber of Clifton Park, Donald R. (Lynn) Hoffman of Alexandria, Va. and Keith E, (Kathleen) Hoffman of Brunswick; a sister, Ruth Watson of Burlington, Vt. and his grandchildren, Sabrina Barber, Kelly (Gary) Conn, Jeffrey and Emily Hoffman. Funeral Sunday 4 p.m. at the Perry-Komdat Funeral Chapel, 2691 NY 43 at Glass Lake, Averill Park. Relatives and friends are invited and may also call at the funeral chapel on Sunday 1-3:45 prior to the service. Interment Sand Lake Union Cemetery. If desired the family requests donations may be made in memory of Ernest C. Hoffman to the Averill Park Sand Lake Fire Dept., PO Box 116, Averill Park, NY 12018, the Community Hospice of Rensselaer Co., 295 Valley view Blvd., Rensselaer, NY 12144 of the Zion's UCC Taborton, 741 Taborton Rd., Sand Lake, NY 12153. Visit perrykomdat.com for directions and private guest book.